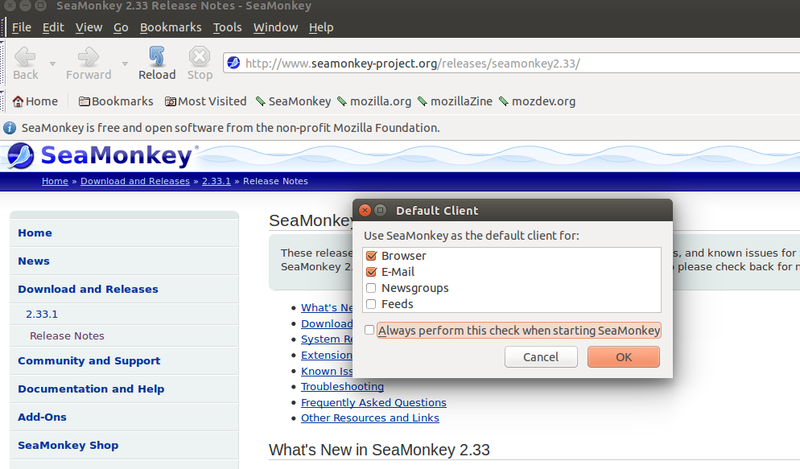 SeaMonkey is a well known, open source, internet application suite based on “Mozilla Application”. This application suite contains Internet browser and email & newsgroup client software. The email and newgroup app is well optimized and feature rich of all, this suite comes bundled with online feed reader, HTML editor, IRC and web development toolset as well. The web browser included in this suite is called “SeaMonkey Navigator” and email client software is called “SeaMonkey Mail & Newsgroups”. This is the continuation of the “Mozilla Application”, which was a project governed by Mozilla corporation, but Seamonkey is a community driven application suite. The development of this application suite was started in 2005 after the discontinuation of Mozilla Application, and so far many releases have been made available for download. The team that handles the development and release management of this suite is called “SeaMonkey Council”. Here are some of the core features of this internet application suite. Lightweight themes and quick response time. Sync feature to keep your browsing history, passwords, bookmarks secure. Session restore feature to bring back all tabs in case of accidental close of the browser. Central management of all the interfaces using Data Management feature. Smart location bar and pop-up blocker feature. “Find as you type” and safe mode browsing. Tabbed Mail feature to better manage your mails and folders. It offers smarter Junk Email control system. Allows configuring multiple email accounts. Integrated blog and news feed reader features. Enterprise-ready features like S/MIME, LDAP, Digital Signing etc. Seamonkey package was available in the older versions of ubuntu, but it was removed sometimes couple of years ago due to the unavailability of volunteers to maintain the seamonkey package. However, we can still include it in our Ubuntu APT manager by performing couple of additional steps. Launch your terminal and run following command to append details for seamonkey package to sources file. Now run following command to add keys for these packages. That’s it, Seamonkey is included in APT repositories now, Run following command to install Seamonkey Internet Application suite. This application suite is being used by advanced level computer users like IT professional, web developer, software testers etc. Its components are extensible with the help of different available plugins. It is cross platform application suite and has good fan following. This document does not work. abort: repository ./. not found! Can you please provide details of where exactly this error message is occurring ? There are various typos that make those command not work.